Stamp Papers form an integral part of any business transaction today. The payment of proper stamp duty on a document makes it legally valid and admissible as evidence in the court of law. Online payment of stamp duty can be paid through eGras, eSBTR, e-Challans. However, all states across the country do not provide all the options and online payment of stamp duty is available in very few states in the nation. While the government uses a digital interface for e-Stamp paper and e-Stamping, the process of paying stamp duty for the common man still involves a manual process. When compared to the pace at which businesses operate, the process of acquiring stamp paper is slow, time-consuming and requires a huge amount of patience. This discourages many businesses from using stamp paper for many business transactions. Documents printed on Stamp Paper make it legally valid in the court of law. Where Do Businesses Use Stamp Paper? Stamp Papers are used to draft agreements/contracts as well as affidavits. Every agreement, right from the office’s rental agreement to the cafeteria vendor agreement needs to be printed on stamp paper. While contracts are required for everyday business transactions in almost all industries, affidavits are commonly used by regulatory bodies that issue circulars. Nevertheless, the lack of easy and quick access to stamp papers delays processes such as onboarding vendors and getting into client and service agreements. However, if stamp duty is not paid for an agreement, the agreement would not be considered as legal evidence in the court if one of the parties dishonors the terms agreed upon. This is where the Digital Stamp Solution and Contract Workflow Automation can be used to speed up business documentation and processes. How Can Businesses Use A Digital Stamp Solution? 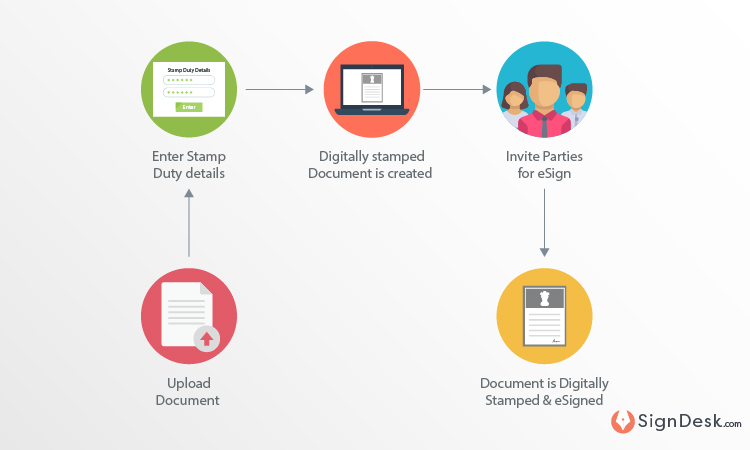 Businesses can procure Digital Stamp Papers through a provider like SignDesk and merge documents with Stamp Paper to make them legally valid and admissible in the court of law. If the need for a signature on the document arises, it makes it easier to invite the party to electronically sign the document. The entire process can be completed in less than 24 hours. This reduces the lag in paperwork making the documentation workflow simple and convenient. The Fast Moving Consumer Goods (FMCG) industry is highly dependant on vendor-based services which makes vendor onboarding and renewal of vendor contracts a crucial aspect of the business. The manual process of onboarding vendors requires the procurement of stamp paper, printing the document/agreement on it, and getting it signed by all the parties involved in the transaction. The time taken to execute the agreement ranges from a few days to a week or sometimes even longer when more than two people need to sign an agreement. A Digital Stamping Solution along with an add-on eSign service can cut-short the time taken to onboard vendors from a week to a day. And not to mention, the upgrade from a paper-based system to a digital system cuts down on the operational cost, time and effort put into onboard vendors. Loan agreements need to be printed on Stamp paper which puts stamp paper at the crux of all transactions in Fintech, NBFCs and many transactions in Banking institutions. Manual procurement of Stamp Paper and collecting physical signatures of the applicants on sanction letters, consent forms, mandate forms, and agreements is a cumbersome process. Using a Digital Stamping solution with an eSign solution makes the process of sanctioning a loan seamless and improves the customer’s experience. Every company has a Human Resource department that creates employment agreements. These employment agreements can be printed on Stamp Paper instead of the company’s letterhead. Similarly, Human Resource consultancy firms create numerous employment agreements on a daily basis. As a mediator between a company and its employees, it’s always better to clearly state the terms and conditions and have the employment agreement printed on Stamp Paper. With our solution, employment agreements can be merged with Digital Stamp Paper online. It also makes it easier for candidates to sign agreements as they can be invited to digitally sign the documents. Home Rental Networks take houses on rent from homeowners and rent them out to individuals and families on an everyday basis. The process of renting requires the creation of rental agreements for which stamp paper is mandatory. 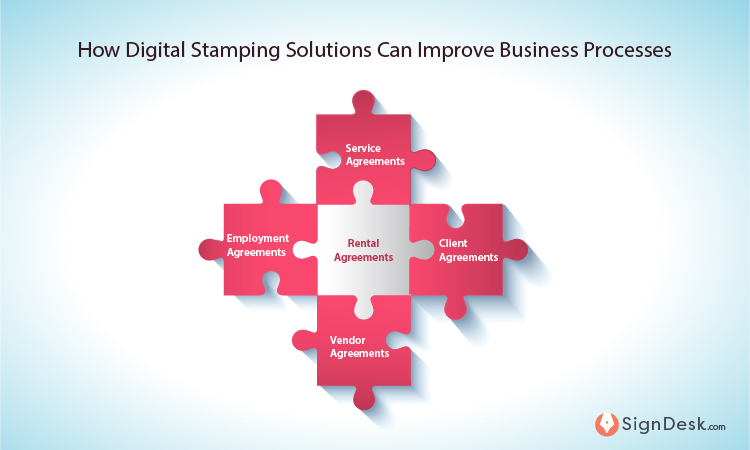 A Digital Stamp can ease the process of creating rental agreements by merging the agreements with stamp paper. This helps save the time and effort involved in manually acquiring stamp paper and printing the agreement on it. If combined with an eSign solution, the agreement can be shared with the concerned parties who need sign it further reducing the time taken to complete the process. Easy Documentation: Documents that are created on a digital platform are easy to access and store. As paperwork is reduced, it eliminates the time spent on searching and retrieving documents. The risk of losing important documents is also taken care of. Faster Process: A solitary platform through which Stamp Paper can be acquired and agreements can be signed reduces the time taken from the initiation of the agreement to the time that the agreement gets closed. Improved Security: As confidential documents like Non-Disclosure Agreements will reach the concerned people directly, this eliminates the risk of leakage of confidential information. We at SignDesk offer a complete Contract Workflow Automation solution which includes solutions like Aadhaar-based eSign, Digital Stamping and Aadhaar-based eMandate. eSign your documents, merge documents with Digital Stamp Paper, and create eMandates within minutes with our one-of-a-kind document workflow automation solution. Make your business’s document workflow simple, quick and secure with SignDesk’s Contract Workflow Automation. Have you yet tried this innovative Documentation Workflow solution yet? What more features would you like to see in the future? Share in the comments below.